SGG Diamant transmits up to 92% of visible light, depending on thickness and is a high quality clear float glass with exceptional clarity and high light transmission. 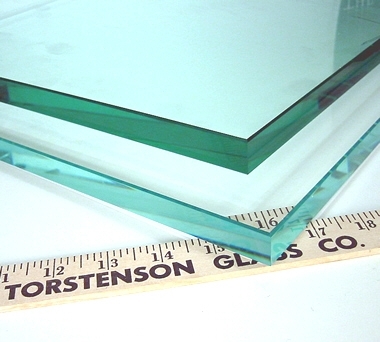 Often called “low-iron” or “extra white” because it does not have the dark green tint characteristic of ordinary clear float glass when viewed from the edge. Can be laminated to provide safety, security and added acoustic performance as well as to stop fading of paintings, fabrics and furnishings by ultra-violet radiation. Can be incorporated in double-glazed units to provide multi-functional glazing including solar control, thermal insulation, acoustic insulation, safety and security glazing. This glass is not totally colorless and a light green tint will become more apparent when viewed in larger pieces against a dark background. SGG Diamant shown on bottom, ordinary transparent glass on top.